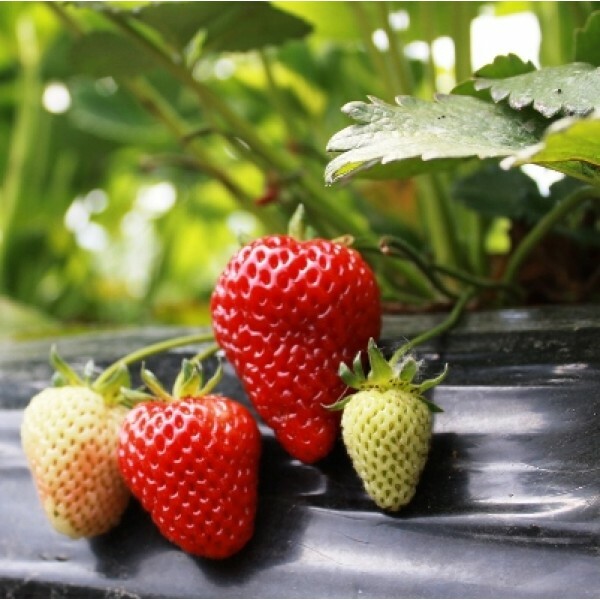 Strawberries require a fair amount of maintenance to produce a good crop. You can maximize yields by continually renewing your strawberry bed with new plants. Plants bear in their second season. Plan to set your new plants out in early spring, just as the trees in your area leaf out. For best yields, start a new bed of plants each year and take out beds that have fruited. Select a site that offers full sun and good drainage and air circulation. In spring of the first year, pick off blossoms to prevent fruiting and encourage production of healthy daughter plants. In late spring, train daughter plants to take root in a 9-by-9-inch spaced row system. In late fall, after a few freezes, mulch with 5 to 6 inches of straw or 4 to 5 inches of pine needles. During the second year, in late spring, remove the mulch gradually in spring, but protect blossoms from late frost with covers of mulch, if needed. Provide 1 inch of water per week while the fruit is developing, through harvest. Cover the patch with tobacco cloth or strawberry netting to keep birds out. After harvest, till the plants under, plant a cover crop, and prepare the bed for new plants next spring. Prepare the garden bed by using a garden fork or tiller to loosen the soil to a depth of 12 to 15 inches, then mix in a 2- to 4-inch layer of compost. Space your rows 4 feet apart. Trim the roots of the new plants to no more than 6 inches long. Soak the roots in water for about an hour before planting. Set the plants 18 inches apart in the rows. Dig holes in the ground deep enough so the roots are covered but the crown isn't buried. Pack the soil against the roots. The first berries are likely to ripen between four and six weeks from when blossoms open. Pick fruit by pinching the stem with your finger and thumb about a half-inch behind the berry. That way you remove the berry without bruising it.